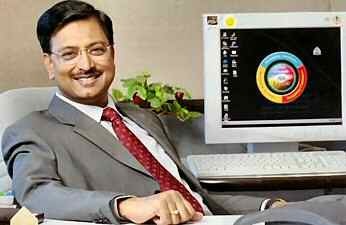 B.Ramalinga Raju, the architect of the mega fraud that has brought India’s fourth largest IT services company Satyam Computer to its knees, has been arrested on charges of criminal breach of trust, criminal conspiracy, cheating, falsification of record and forgery. The arrest is no surprise considering that Raju has confessed to engaging in massive accounting fraud to boost the company’s profits. Indian media reports say that Ramalinga Raju surrendered before the police in the South Indian city of Hyderabad and was arrested. Ramalinga Raju’s brother B.Rama Raju (who was Managing Director of Satyam) has also been arrested. But why did it take 60 hours for the Indian police to arrest Ramalinga Raju considering the crimes he’s confessed to? * For the September quarter, Satyam fraudently reported a revenue of Rs 2,700 crore and an operating margin of Rs 649 crore (24% of revenues) as against the actual revenues of Rs 2,112 crore and an actual operating margin of Rs 61 crore (3% of revenues). This has resulted in artificial cash and bank balances going up by Rs 588 crore in Q2 alone. * Raju acknowledged that the gap in the balance sheet had arisen on account of inflated profitsÂ over a period of last several years. Satyam was until recently hailed as India’s fourth largest software exporter with marquee clients like GE, Microsoft, Nestle and Quantas. 2 Responses to "Indian Outsourcing Crook Ramalinga Raju Arrested"
There is an interesting article in TOI which tells he might be trying to cover up a bigger lie through his confessions. He might’ve used up the money for his personal puposes. Even i was wondering how satyam has only 3% profit margin whereas INFOSYS, TCS or WIPRO’s profit margin is between 20-30% range. “It’s a crime to show money in the books where none existed, which is what Raju said he did. But it’s a worse crime to take out money that actually did exist”. Yeah, we saw that too. That’s an interesting point – on the low profit margin compared to Satyam’s peers. We wouldn’t be surprised if Maytas is badly impacted by the Satyam fallout. Thanks for the TOI link. I would not rate Raju as the ‘worst’ amongst the scum of the society. He confessed instead of resigning and escaping to Dubai. Did you notice that 6 board members from various other real estate companies have also resigned recently…could the reason be similar to this? My accounting professor says ‘Hundreds of companies have huge holes in their books, its just that one fish confessed about it…’. Will we ever be able to find out the other fishes? Would stringent corporate governance laws be passed? Not sure if anything substantial (by way of improved corporate governance regulation and enforcement) will come out of the Satyam disaster other than tinkering around the edges.